Infographics are graphic visual representations of knowledge, information or data to disseminate information easily and quickly. 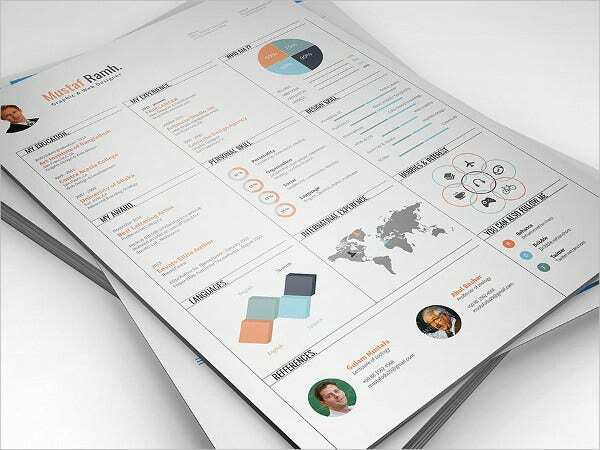 Today, infographics are being increasingly used in resumes instead of those boring text-only documents. These are visually appealing, informative, and fun-to-read, and hence they capture the attention of the viewer. Thus these can boost your job search or impress your potential clients. 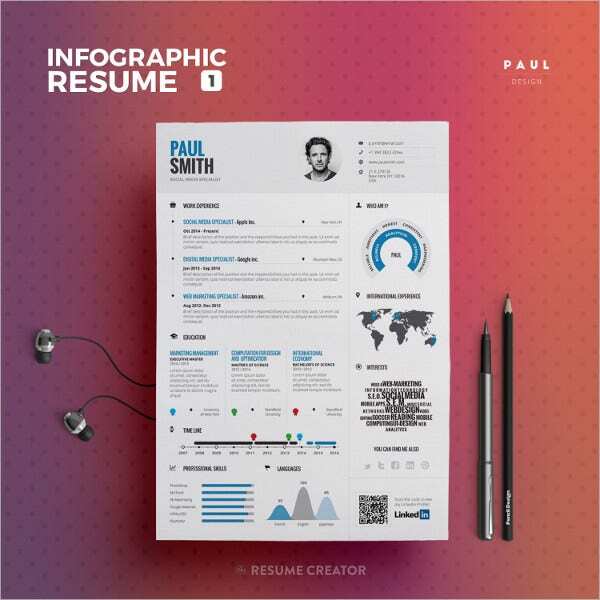 Here are some creative Resume Templates to help you upgrade your traditional resume as per the current market trend. 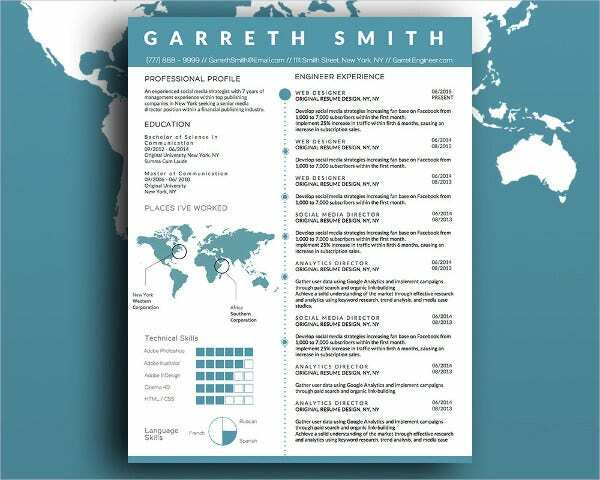 This Professional Resume Template is available in Photoshop, Microsoft, and Illustrator; it costs $6. It is clean-looking, editable, labeled, high-resolution, and organized. It includes a cover letter, a resume, and a reference letter. 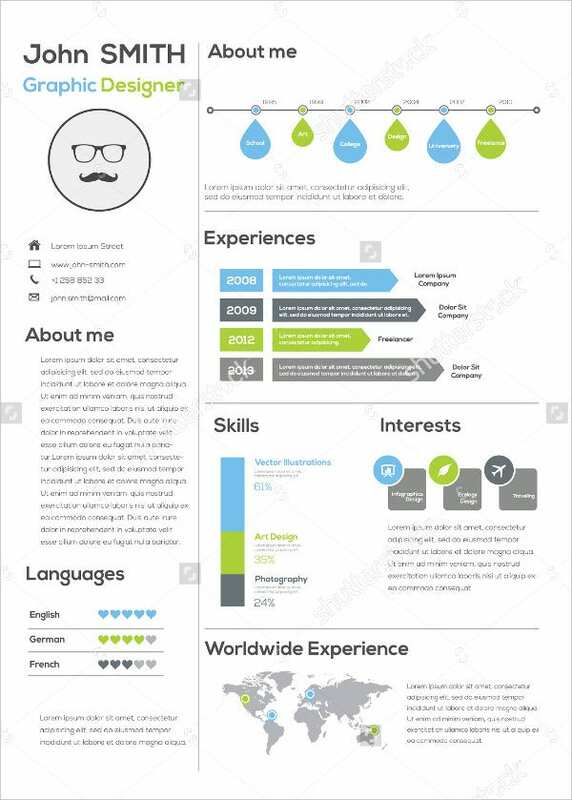 This fully customizable Resume Template costs $12. It features 2 pages, 300 dpi resolutions, a matching cover letter, print-ready format, CMYK color scheme, A4 size, free fonts, 20+ hobby icons, 50+ social icons, etc. 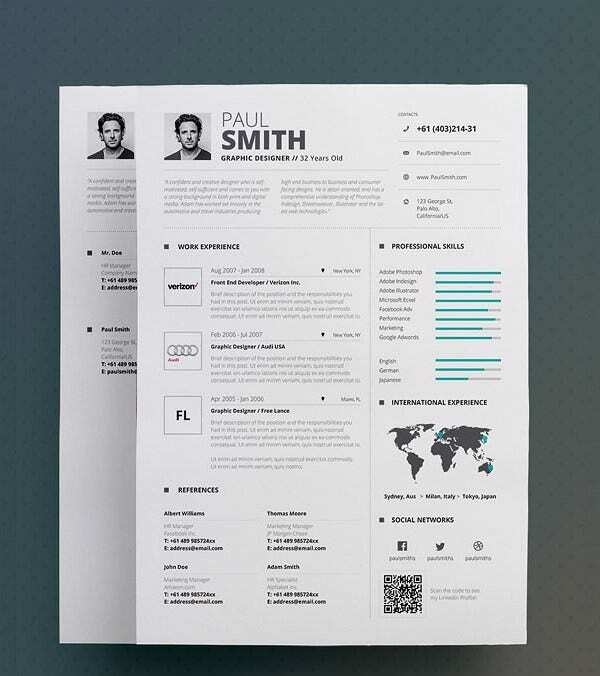 This beautifully designed resume for job seekers. It is in MS Word format and comes with a video guide. Available at $9, its usage is restricted to personal use alone. 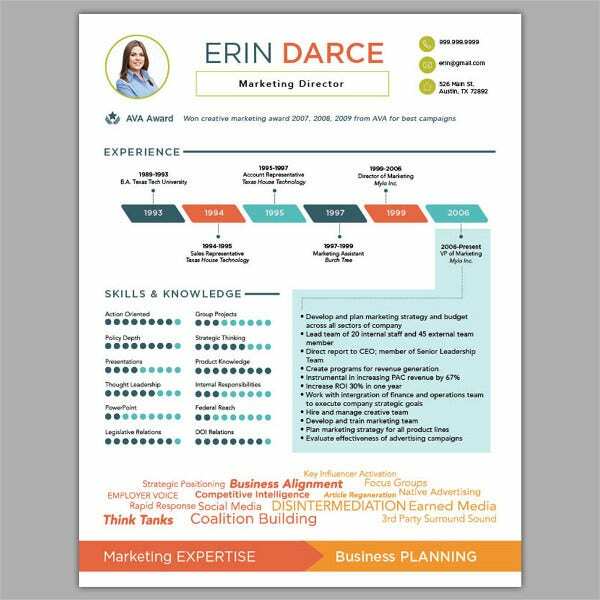 This easy-to-edit template with a professional layout features 2 single page, 300 dpi resolutions, a matching cover letter, print-ready format, CMYK color scheme, A4 size, and US letter, etc. It costs $7. 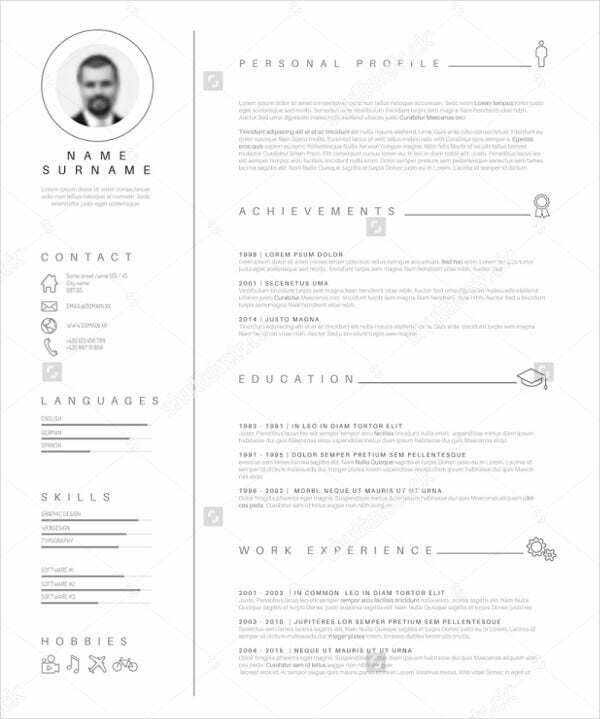 Costing $10, this attractive resume features a single page, 300 dpi resolutions, matching cover letter, print-ready format, 50+ social icons, A4 and US letter sizes, etc. 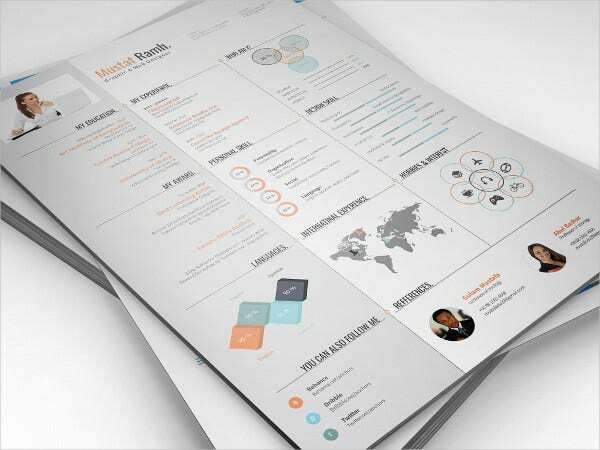 Available for $6, this resume is fully editable and customizable. It is of A4 size and comes in 2 clean versions. It features CMYK and uses free fonts. 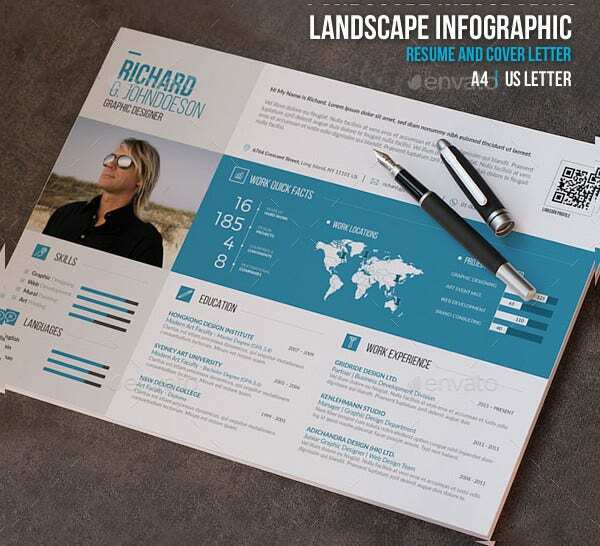 It costs $7 and includes a resume layout and 3 cover-letter layouts (2 landscape and 1 portrait). It features 3 color variations, 300 dpi resolutions, CMYK color, A4 and US letter sizes, etc. 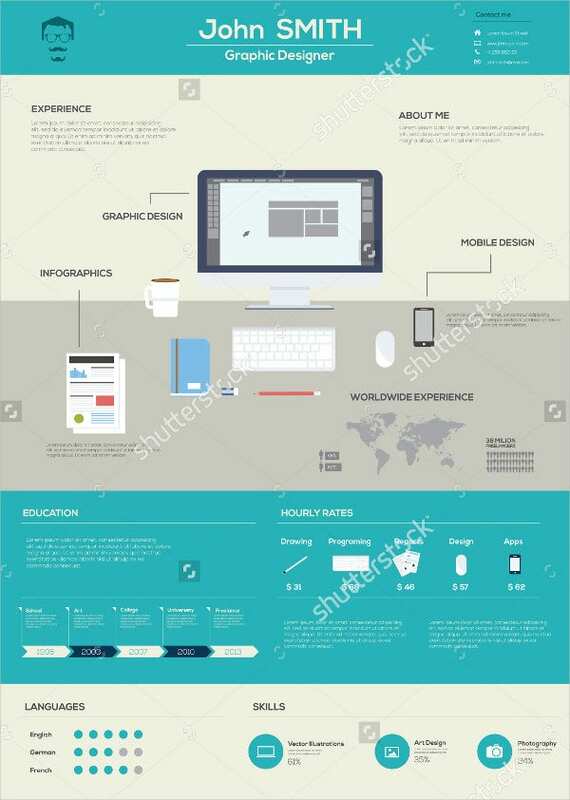 This is a free infographics and timeline resume vector illustration. It is of high-resolution and is available in different sizes. It includes sections of about me, skills, experiences, interest, and worldwide experiences. 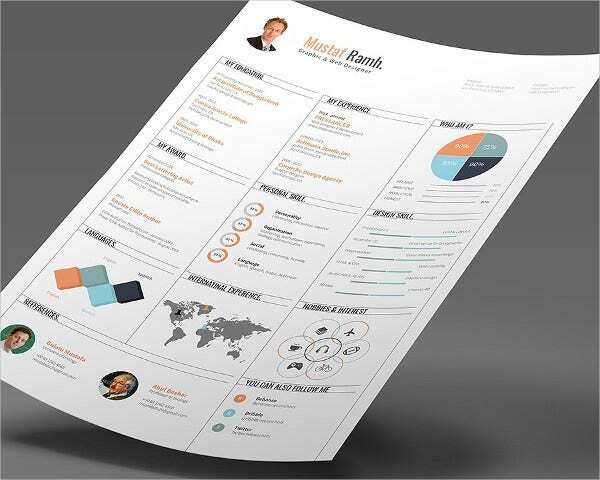 This impressive resume template of 8.5×11 inches helps showcase your personality, skills, and experience in a creative way. It costs $180. It will be received as a printed copy. 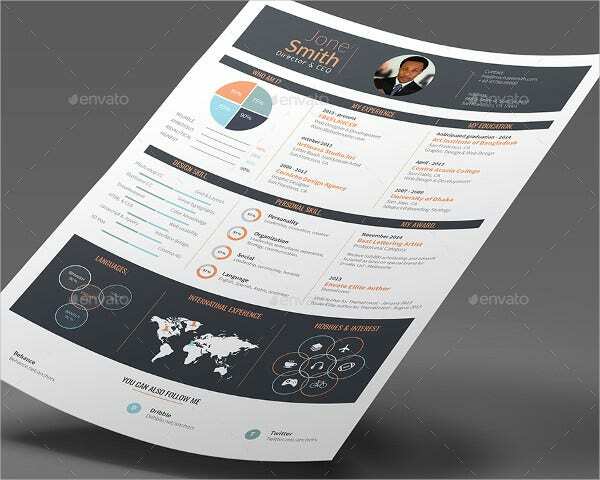 Costing $5, this resume features CMYK, A4 and US letter size, 02 clean versions, AI file and Vector EPS. It includes sections like Who am I?, My award, My education, Personal Skills, etc. 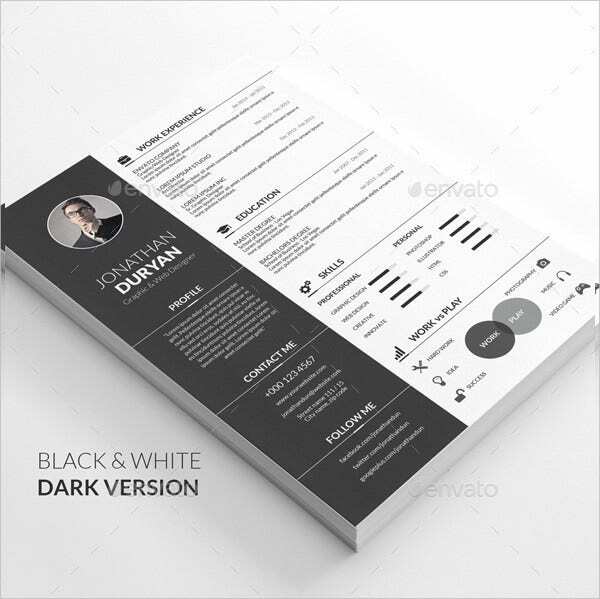 This layered PSD resume template features A4 size, 300 dpi, and CMYK color. It costs $5. It includes personal info, education, experience, computer skills, and “Why should you hire me?” pages. 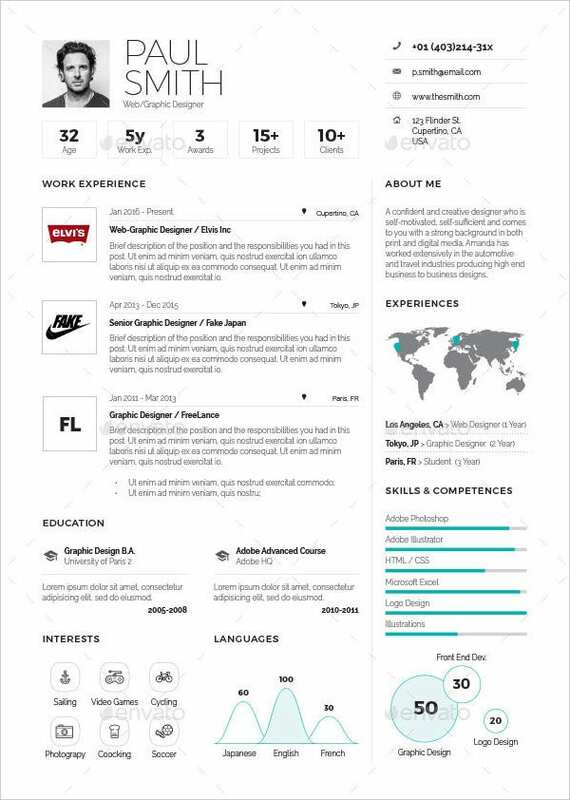 This editable and customizable resume costs $5. 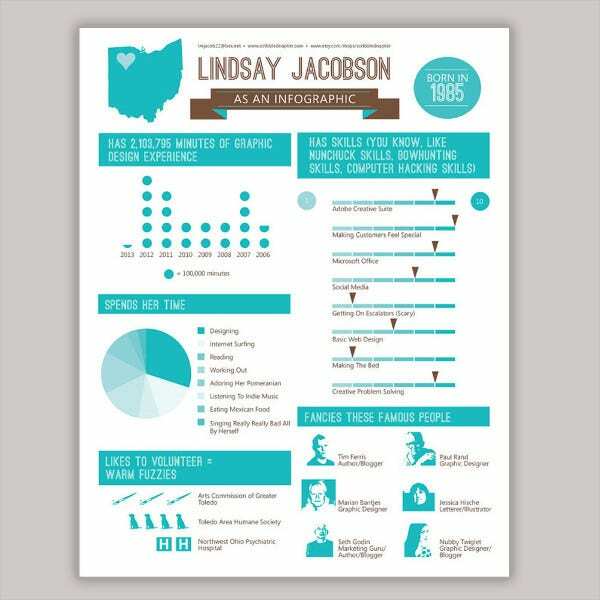 It features CMYK, A4 size, free infographics fonts, Al file and Vector EPS. It includes Who am I?, My award, My education, Personal Skills, etc. 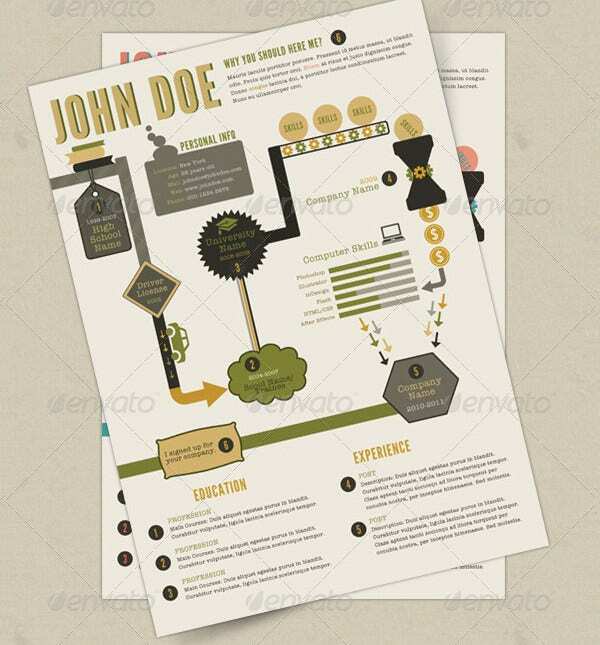 This resume template vector illustration is of high-resolution and several sizes. It is of minimalist design; has nice typography; and is available for free download. This editable and fully customizable template is available for $6. It features CMYK, A4 and US letter size, 02 clean versions, Al file and Vector EPS. It includes 11 sections. 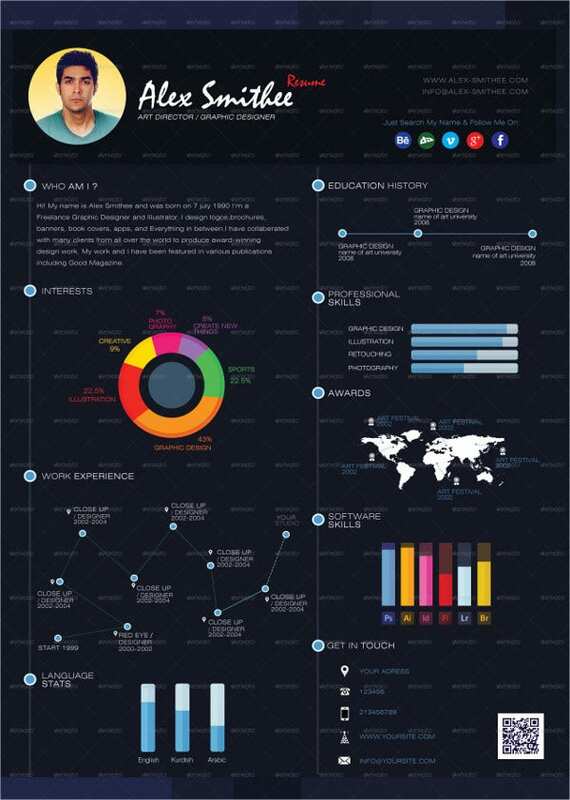 Infographic Resume Template designs make your resume visually appealing and leave the viewer with an unforgettable and amazing document. 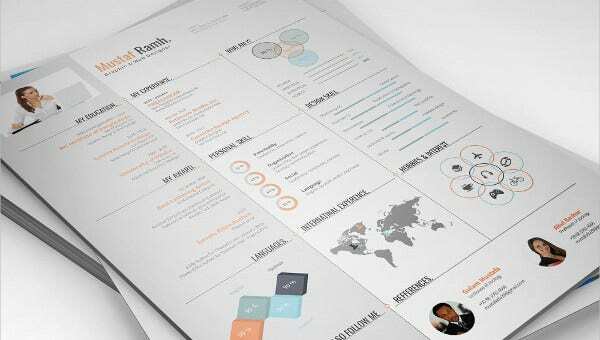 You can make use of the above templates to add value to your qualification, achievements, rewards, skill sets, etc on your resume. Go ahead, download the template of your choice, customize it, and be on your road to success!